Pros: Your former employer may have a 401(k) administrator and/or custodian that you really like, with investment options you find desirable and that have delivered solid performance. You may also have a long history with the company, and therefore know the ins-and-outs of getting your 401(k) questions answered. Tip: Not all companies and/or 401(k) administrators will let you keep your 401(k) there once you leave, but many do – you can just ask the administrator or your HR contact to find out. Cons: Leaving your 401(k) behind means ceding control over who your custodian is, who manages your assets, and what your investment options are. Rolling your 401(k) over would give you control over those considerations. Also, there’s a chance your employer could change the plan administrator, or that the plan administrator can change the investment options in the future. If you’re thinking about leaving your 401(k) where it is, make sure to run the idea by your wealth manager first. He or she can help you vet how well your existing investment plan is designed to serve your needs and make suggestions for improvement. Pros: If your new employer has a 401(k) plan, you may have the option of rolling your old 401(k) into your new 401(k). The biggest advantage here is that you can consolidate your retirement plans and keep everything in one place. Having fewer accounts to manage could mean giving each account the attention it needs. Tip: The process of moving a 401(k) from one employer to another is fairly simple and straightforward, however it will likely involve speaking with the plan administrators of both 401(k) plans. You might need to speak with people in HR at both companies to get it done, and it might involve a bit of back-and-forth and paperwork. Alternately, you could enlist a Wealth Manager at WrapManager to help you seamlessly handle the entire process. Cons: Not all 401 (k) plans are created equal. Your new employer may have a 401(k) plan that’s lacking in solid investment options or is managed by a plan administrator that is less-than-optimal with operations help and reporting (statements and online access). Pros: If you’re rolling a 401(k) into an IRA, you have almost unlimited options as to how you can invest your money. There are hundreds of good money managers and investment programs out there to choose from. Additionally, since rolling over a 401(k) involves creating a new account and choosing new investments, why not also use the opportunity to review all of your investments and re-evaluate your plan? It’s a perfect time to think about your investment objectives, risk tolerance, and to determine whether your current funds or money managers are meeting your needs. Tip: The first step in rolling over your 401(k) is deciding where it will go. Do you already have brokerage or retirement accounts at your bank or another custodian, like Fidelity or Schwab? 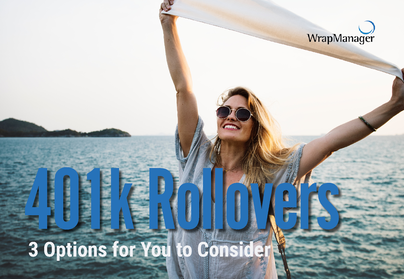 Once you know where it will go, you can fill out paperwork to open a Rollover IRA account (this can even be done online in many places), and then work with a representative or a Wealth Manager at WrapManager to help you facilitate the rollover. Whatever you decide to do, make sure that you fully understand the implications of a 401(k) withdrawal vs. a 401(k) rollover. The difference is important and getting it wrong could cost you! At WrapManager, we have Wealth Manager who can help you evaluate your 401(k) options so you make a decision that best meets your needs. Even if you’re not retiring or switching jobs, our Wealth Managers can still help – we can take a look at your investment options, your current allocation, and make recommendations based on your goals and needs. Start a conversation with us today at 1-800-541-7774 or over email at wealth@wrapmanager.com. This material is not intended to be relied on as a forecast, research or investment advice, and is not a recommendation, offer or solicitation to buy or sell any securities or to adopt any investment strategy. The information presented is general information that does not take into account your individual circumstances, financial situation or needs, nor does it present a personalized recommendation to you. The information and opinions contained in this material are derived from sources deemed reliable, are not all-inclusive and are not guaranteed as to accuracy.